As its name says, STROBE is a framework for conducting a STRuctured OBservation of the Environment. In its original form, it was designed for analysis of a decision-maker’s office. The decision-maker was usually, but not necessarily, a manager. Each of these features was used to make inferences about the decision-maker and the organisation. This should become clearer via a worked example. Here’s what happens when you apply a version of STROBE to my office. The diagram below shows the location of my office. It’s near a turn in a corridor. 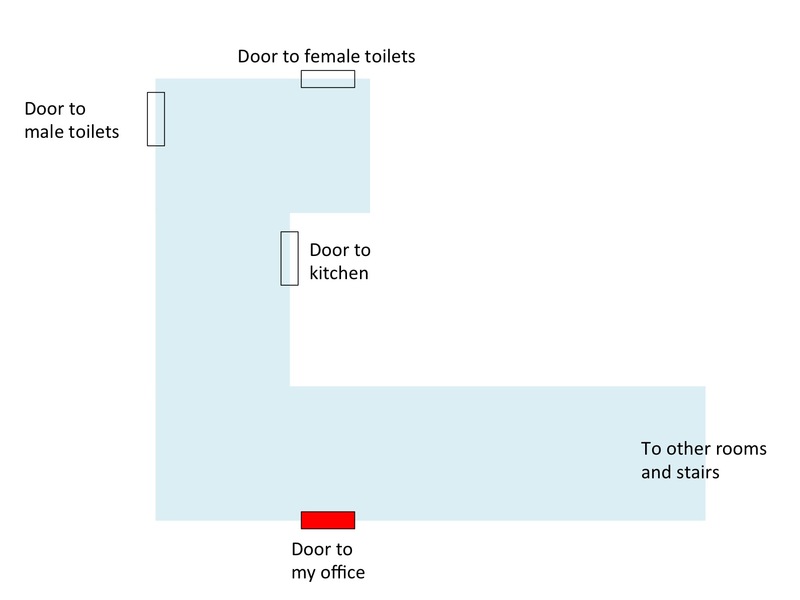 There are some frequently used locations in both directions (the male and female toilets, and the kitchen containing the tea/coffee making equipment). Traditional STROBE implicitly recognised the concept of “flight path” but didn’t have an explicit term for it. Because my office is on three heavily used flight paths, I usually keep my door closed, to minimise distracting noise, and to maintain confidentiality from people outside if I’m discussing a sensitive topic with someone in my office or on the phone. This can give the impression that the office occupant is aloof and unapproachable. In my department, we’ve tackled that problem by having an “about me” page on each door, with a friendly photo of the office occupant and some information about them. In the original version of STROBE, this observation was used to make inferences about the personality and management style of the office occupant. 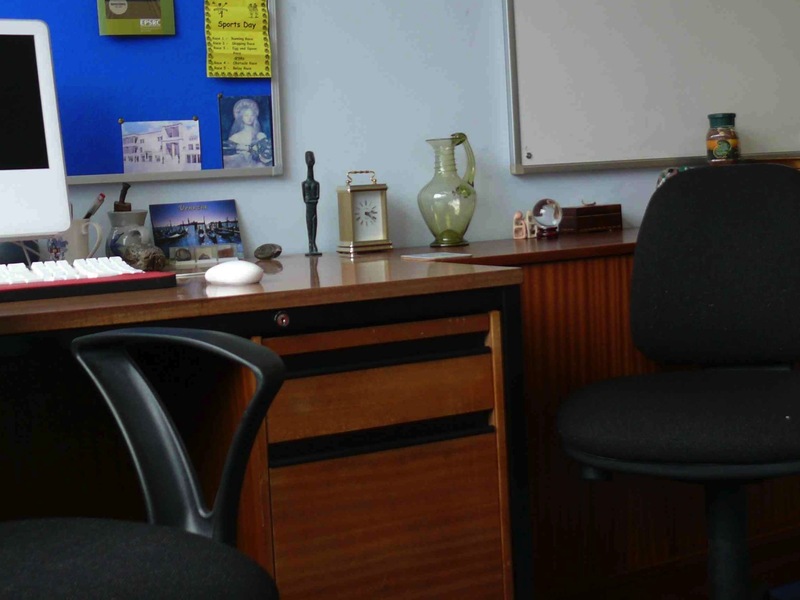 If the desk is placed facing the door, between the occupant and the person entering the office, this implies a confrontational, authoritarian style. If the desk is placed in a side-on configuration, this implies a more egalitarian style. Here’s a photo of what you see when you open my office door. My desk is side-on to the door. Does this mean that I’m egalitarian and approachable? Maybe. However, if you superimpose a flight path between my chair and the door, it’s a straight line. Maybe I just didn’t want to have to walk round my desk every time I entered or left the office. This uncertainty is one key limitation of STROBE if you use it on its own; you’re making inferences which may be seriously mistaken. Sometimes you’re able to use other information from STROBE to resolve these uncertainties – for instance, STROBE analysis of the easily moved contents of my office strongly suggest that the desk layout is motivated by my approach to information sharing, not simply a direct flight path to the door. In general, it’s wise to use STROBE in combination with other techniques that are good at eliciting the reasons for a particular feature or layout, such as laddering and scenarios. In the original version of STROBE, you would look at the colours of the wall, carpet, ceiling, etc, and make inferences about whether this was a welcoming environment. There was an implicit assumption that the office occupant chose those features. In reality, most office occupants have to live with what they’re given. You might be able to make some inferences about the organisation, as opposed to the office occupant, from the colour scheme etc. However, you might just be looking at a colour scheme that reflects which paints were cheap when the office was last decorated. What’s more likely to be informative is the easily movable décor – pictures, posters, etc. I’ll discuss those below, in the section on light, easily movable office contents. In both the traditional version of STROBE and the version I use, you look at the large fixtures and furniture. My office has three filing cabinets, all of them four drawer cabinets. That’s an unusually large number. There’s a reason for it (relating to my journal editorship). That’s precisely the sort of thing that STROBE was designed to spot, so that you know where to start focusing your attention. Another unusual feature of my office is the pair of chairs beside the coffee table. They’re identical chairs, and they’re armchairs. This implies, correctly, that the office occupant has a significant number of informal meetings that are important enough to merit setting up this feature. The coffee table is a low-cost modern replica of a traditional design, strong enough to stand up to the knocks and accidents of a working office environment. Functionality is the prime concern, not trying to impress the visitor with expensive antiques. Here’s a view of my office from the armchair area. There are a lot of small, easily movable items, such as the figurine, the clock and the glass jug. What do those items tell you? The clock is midway between my chair and the chair for visitors. Is that so that we can easily keep track of the time without needing to glance awkwardly at our watches? If so, that implies that the office occupant is often constrained by time. That assumption is right; the clock is there for just that reason, and is a couple of minutes fast, to allow for the human tendency to leave everything till the last moment. The figurine and jug are there to make the clock look more like a decorative feature, and less like a pointed hint. That doesn’t explain why the clock is flanked by a replica Cycladic figurine and a replica Roman glass jug, rather than by something more obviously related to my job in computer science. The reasons partly involve personal aesthetic preferences, and partly making the point to visitors that a lot of my work is multidisciplinary. This can be very useful for heading off misconceptions before they arise, and can also be very useful as an introductory topic of ice-breaking conversation. In the original version of STROBE, you looked around the office to see how many sources of information were in-house, and how many were external. 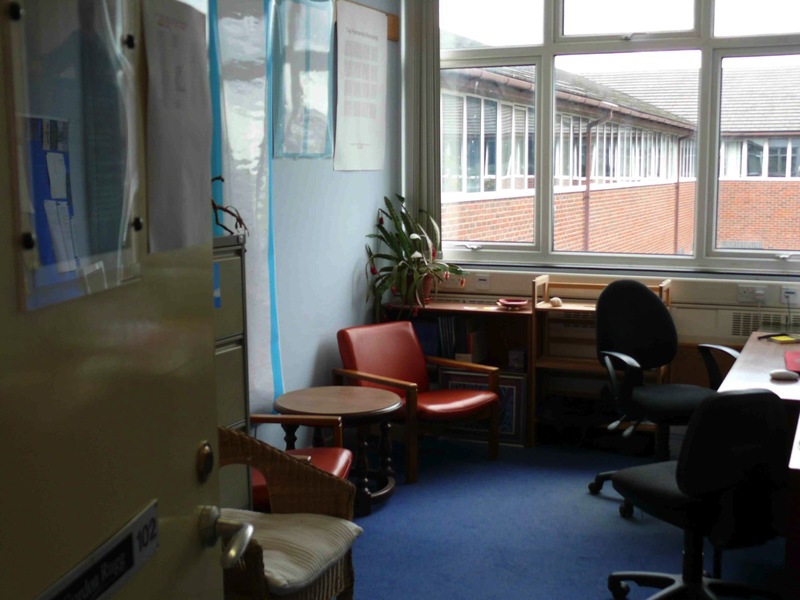 This gave you an idea of how inward-looking or outward-looking the office occupant and/or the organisation might be. That was before the Internet. Now, office occupants usually access information via their computer, and you have no way of knowing what types and sources of information they’re using. However, you can still tell a lot about how the office occupant uses information, and make inferences from that, if you look at some other indicators. For example, the computer on my desk is positioned so that it’s easily visible both by me and by visitors. That’s deliberate. I routinely show documents to visitors, including students, and discuss those documents with them. However, if I want to check something confidential, I can easily swivel the computer so that the information isn’t visible to the visitor. Similarly, there’s a whiteboard prominently located on the wall, where it’s easily visible from all the chairs in the office. It’s clean, ready to be used immediately. There’s a basket below it, on the right, that contains whiteboard pens and a chunk of kitchen roll for wiping the board clean. This suggests, correctly, that the office occupant uses the whiteboard a lot. 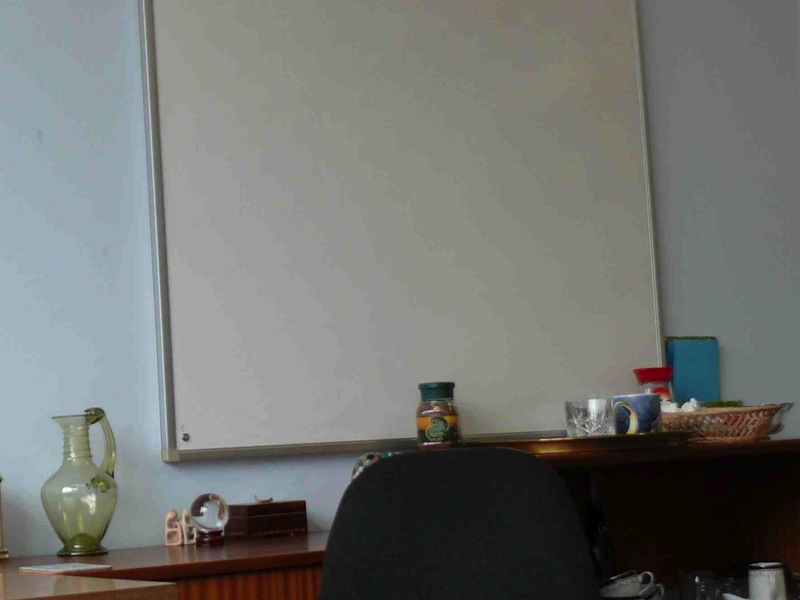 It also suggests that visitors also use the whiteboard a lot – the whiteboard is located where everyone in the office has easy access to it, rather than behind the decision-maker’s desk. The basket contains a lot of pens in different colours, implying (correctly) that the whiteboard is often used for complex diagrams, not just to list ideas or to write equations. Some quick questioning would uncover more layers of design rationale. For instance, one reason for the whiteboard being wiped clean is that I quite often discuss commercially sensitive ideas with students and other visitors. If we use the whiteboard to work something out, I make sure to wipe it off the board once we’re finished. The reason for that relates to patent laws, and their requirements about confidentiality. STROBE works well when combined with other techniques. I’ve mentioned flight paths as something that fits neatly with STROBE; we’ve blogged about flight paths in an earlier article. Design rationale is another neatly complementary approach. There are also significant overlaps with sociotechnical approaches. STROBE also combines well with techniques for eliciting reasons for designs and actions, such as laddering, critical incident technique and scenarios. STROBE is useful as a way of giving structure to how you observe an office and how you decide where to focus your attention. Some parts of the original STROBE are now a bit outdated, but the core concept is still helpful. There’s more about the background theory in my latest book. This entry was posted in elicitation, research methods and tagged design rationale, observation, office layout, sociotechnical by hydeandrugg. Bookmark the permalink. Excellent, I remember doing this on my MSc at Keele. Realising that I applied STROBE principles autonomously.